Jatiya Oikya Front convener Dr Kamal Hossain on Saturday said the participation in the 11th parliamentary polls keeping Jamaat in the alliance was a mistake. The Gano Forum president added that they won’t do any politics with the Islamist party. 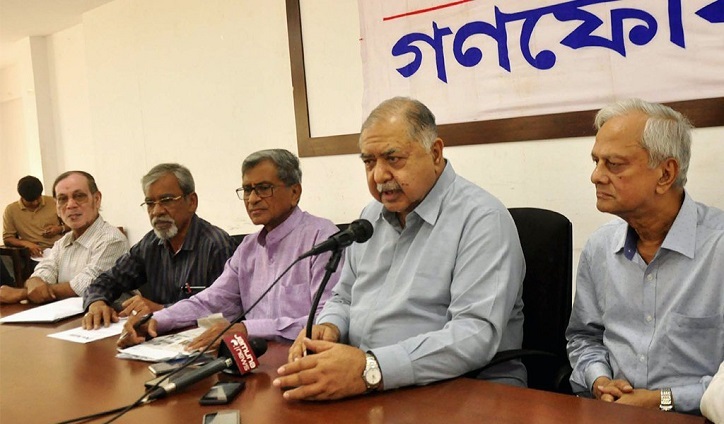 Dr Kamal came up with the remarks at a press conference at Gano Forum’s Arambagh central office in the capital after a meeting of the party’s central committee. In reply to a question, the veteran jurist said they will mount pressure on BNP to cut ties with the fundamentalists. He reiterated that it was a mistake since Jatiya Oikya Front was formed in a hurried manner, and that he was not aware of Jamaat in the coalition. At the press conference, Gano Forum General Secretary Mostafa Mohsin Montu, also coordinator of the Oikya Front, said he asked BNP Secretary General Mirza Fakhrul Islam Alamgir not to involve Jamaat in the newly floated alliance, but the BNP leader told them that the Islamist party is only in their 20-party alliance. Earlier, Dr Kamal held a meeting with his party central committee members to discuss the country’s prevailing political situation. The meeting also discussed the 11th parliamentary election, its results, their loss and gain in the polls and BNP’s affinity with Jamaat, a source said. According to the party insiders, Gano Forum is likely to sever ties with its key ally Bangladesh Nationalist Party (BNP) over the issue of Jamaat, a party of war criminals. The Gano Forum high-ups have repeatedly been asking BNP to cut ties with Jamaat, but BNP gives the version that Jamaat is a component of their 20-party alliance only and the Islamist party has no role in the Oikya Front. A source said Gano Forum is mounting pressure on BNP and if BNP doesn’t ditch Jamaat, Gano Forum might ditch BNP. It added that two Gano Forum MPs-elect are also interested in taking oath and the party leaders also expressed their view in favour of oath taking. Talking to daily sun, an Oikya Front leader said there has already been a distance between BNP and Dr Kamal Hossain over taking oath as Gano Forum MPs-elect are keen on taking oath, ignoring request from BNP that is against oath. As a political partner of the 20-party alliance, 25 leaders of Jamaat-e-Islami took part in the election with BNP’s electoral symbol “Sheaf of Paddy”, but failed to secure a single seat. Against the backdrop of a changing political situation, BNP leaders are now divided over the issue of maintaining its political partnership with Jamaat-e-Islami, a key ally of the 20-party alliance. BNP insiders said a bevy of leaders are keen to dump Jamaat to avoid pressure from international community including India, but the notion fails to gain steam as the party high command prefers Jamaat alliance. Talking to daily sun, a number of BNP leaders at grass roots levels said they are in favour of severing ties with Jamaat for upholding the party image. They term Jamaat-e-Islami a party of war criminals and its men are also allegedly involved in ‘militant’ activities. Sources inside BNP also said a section of the party leaders are also in favour of cutting ties with Oikya Front as well as Jamaat only to be self-reliant.